Plex created real business benefits for Ralco Industries by reducing scrap rates, downtime, employee turnover, setup times, and more. An automotive stamper reduced annual premium freight costs by more than 20 percent. Scrap rates are down by more than 60 percent, and the company cut downtime and employee turnover. Implementing Plex Cloud ERP resulted in dramatic inventory cost reductions, letting the company achieve an ROI in a little more than one year. Ralco Industries, Inc., is an ISO/TS 16949-certified tier-one and -two automotive supplier specializing in precision welded assemblies, metal stamping, design, tooling, and prototyping. The company serves worldwide OEMs with exhaust, steering, chassis, suspension, seating, and HVAC parts and assemblies. “In past years, our inventory accuracy was only about 50 percent,” says Jim Piper, President of Auburn Hills, Michigan-based Ralco Industries. “We conducted grueling physical inventories every month, and they would be off within the following week. We never knew if we had enough parts to build a setup. Given these and other challenges, Ralco’s goal was to find one software system that could integrate all facets of its manufacturing business. 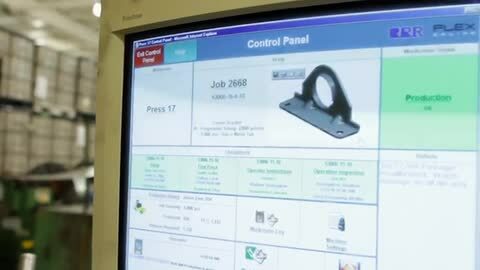 Ralco wanted to move away from separate manufacturing resource planning (MRP) incapable of machine PLC integration. Ralco also wanted to avoid stand- alone software for shipping and receiving. After a detailed search, the company found that ERP from the Plex Manufacturing Cloud offered the most advantages over other ERP solutions. The industry-leading cloud solution is fully integrated with the PLCs for all shop floor and engineering equipment. “After switching to Plex, we now cycle inventories. Because of our improved accuracy in inventory, we can do setups faster, and we have been able to reduce our inventory on hand by 15 percent. Plex also has a ‘recipe’ system for setups, so each setup is exactly the same. Plex Cloud ERP uses a simple, Web-based interface and places few requirements on the operator. Unlike software from other companies, Plex is accessed through a Web browser. This allowed Ralco to avoid the cost and hassle of buying, installing, and maintaining the software and server. Plex also supports and enhances the system, including all software upgrades, data backup, and professional system management, at its headquarters in Troy, Michigan. According to Ralco, it was a relief to offload the major database and back-up responsibilities, although security was a big issue. In fact, the company reports that a staff member in the IT Department used to work for the CIA. He spent a month trying to break into the Plex system. He never could do it. Ralco started its implementation with the Plex Purchasing function. Plex is designed so that you can add one function at a time or simultaneously install several. Ralco can now easily match receipts to internal purchase orders, and match purchase orders to invoices. The company has more control and security over purchase orders, and has actually reduced the number of purchase orders. The improved efficiency saves about $100 per purchase order processed. After Ralco’s old MRP system crashed, the company took the plunge and subscribed to Plex functions including: Sales/Customer Relationship Management, Materials, Inventory, Production Tracking, Scheduling, Shipping, Quality, Management, Communication, EDI, System Administration and Security functions. “Our Plex rep, Mig O’Brien, developed a plan on how to design, develop, and implement these functions, and they followed it,” says Piper. Plex Cloud ERP is so easy to use that Ralco was able to reduce training hours by more than 50 percent. Results were huge too. Products are now of a consistent high quality. Premium freight costs were reduced by more than 20 percent per year. Now it’s a rare event to have to expedite a shipment. Scrap rates are down by more than 60 percent. Downtime and employee turnover have both been reduced drastically. Inventory is down. Setup times have been reduced. And the paperwork and order tracking are now easy. “We were looking for a two-year payback, but it only took just over a year,” says Piper. Learn more about how to select the right ERP system for your organization. Learn how to achieve manufacturing agility throughout your organization. What can you do with Plex? See how organizations like yours are harnessing the power of Plex. See Plex in action and find out how your organization can work smarter.